We’ve seen how we can make a socially responsible enterprise out of a web hosting business, but what about email? The latest free email service to be launched, GiveBackMail (www.GiveBackMail.com), looks to do the same by donating to causes you care about every time you use email. Launched earlier this week, the free service allows you to keep your current email address and still take advantage of features including sharing large files – up to 100MB, managing multiple accounts, previewing attachments and viewing all your social media feeds within your email platform. 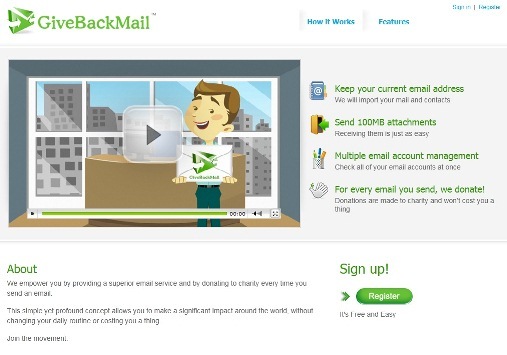 GiveBackMail was developed to empower people who want to help charities, but don’t have enough time or money to do so. “What really separates us from other email service providers is allowing our users to give back to the causes they care about most. Together, we can absolutely make a measurable, positive impact on the world,” he adds. What I like about GiveBackMail is that it’s compatible with all major POP3/IMAP email providers – and for free too, unlike, ahem, Yahoo! – and allows you to keep your own email address. Want to help provide meals for the hungry, clothes for the poor, shelter for the homeless or even funding for cancer research? Nominate your favorite cause now before May 31, 2011 at GiveBackMail.